Commissioned in 2001 by violinist Robin Lorentz. One movement work. 14 pages, 8.5" x 11". Premiered and recorded on November 2, 2003 in Santa Fe, New Mexico by Robin Lorentz, violin and Kathleen McIntosh, harpsichord. Recorded January 4, 2006 in Los Angeles, CA. by Robin Lorentz, violin and Kathleen McIntosh, harpsichord. Recorded in 2006 in Rome, Italy by Antonio D'Andrea, violin and Maria Clotilde Sieni, harpsichord. 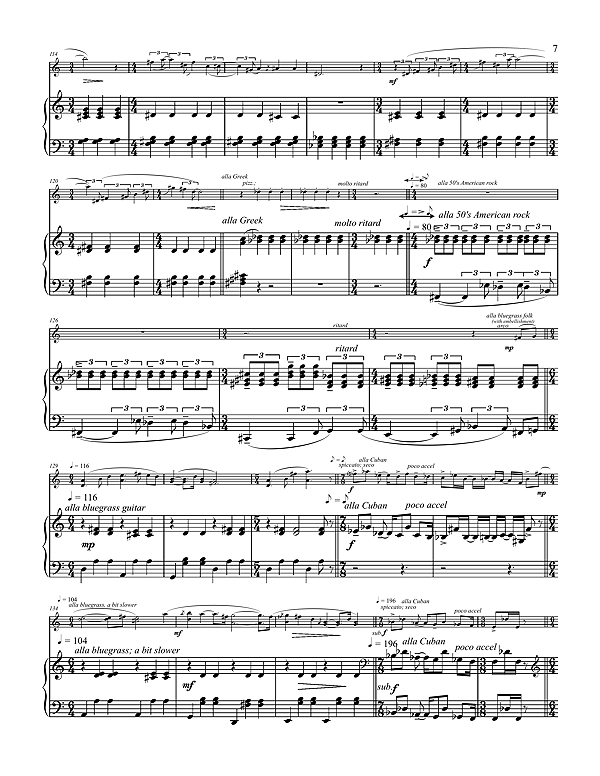 Audio clip performed by Robin Lorentz, violin and Kathleen McIntosh, harpsichord. 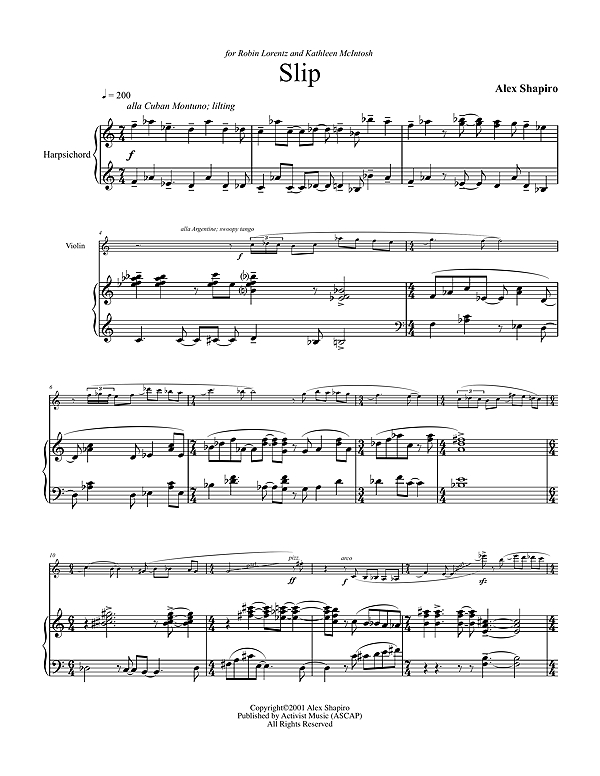 Score and part for Slip available from Activist Music for $20.00 print, or $14.00 digital. Slip was commissioned by Robin Lorentz as a gift for her friend and partner in musical crimes, Kathleen McIntosh. Both women are intrepid and superb musicians who persist in the marvelous delusion that the 18th century's winning combo of harpsichord and violin deserves a repertoire from the 21st, as well. Far be it from me to argue such an inspired position, and so, knowing that my dear comrade Robin can make a violin sing beautifully in every style imaginable, I came up with the idea of giving Kathy everything and anything to play, with the one exception of the baroque styles to which she was so often tethered. Since the violin is found in all corners of the globe, I decided to make the harpsichord a chameleon as well. I turned it into a host of different plectrum instruments, including dulcimer, koto, mandolin, rock n' roll keyboards, guitar and bouzouki. Throw in some Cuban montuno rhythms for a little variety, and suddenly it's a world tour for anyone with attention deficit disorder. This bit of whimsy was written with the intent of giving Robin and Kathy something that would be unexpected at the close of their otherwise respectable concerts. Quite ironically, the first few lighthearted measures were written on September 10th, 2001. After the horrors in New York City the following day, Robin called me up and made it clear that given the circumstances, it would be absolutely fine with her if I felt instead like writing a very serious piece. Thinking about it for a moment, I replied that no, I wanted to continue in this upbeat direction, perhaps as a bizarre antidote for my grief. During the rest of that stunned month, there were times when the television glared silently in the corner of my studio with its constant images of devastation, as I irreconcilably wrote these giddy passages. Slip is featured on the 2007 DC Records CD, La Discordantia, recorded by Antonio D'Andrea and Maria Clotilde Sieni. Click CD for more info. Slipping is featured on the 2007 Innova Recordings CD, Notes from the Kelp (innova 683). Click CD for more info. Adapted from "Slip," commissioned in 2001 by violinist Robin Lorentz. One movement work. 20 pages, 8.5" x 11". Recorded January 4, 2006 and July 11 in Los Angeles, CA. by Robin Lorentz, violin, Kathy McIntosh, harpsichord, and Dan Morris, percussion. Commissioned in 2015 by Bas Duo: Elyse Knobloch and Peter Press. One movement work. 19 pages, 8.5" x 11".